If you were elected president tomorrow, what food would you ban from the White House? Would it be bread? Pizza? Cookie dough? For George H. W. Bush, it was broccoli. In 1990, after years of suffering through his greens, he finally used his new powers to declare an all-out prohibition: “I’m President of the United States and I’m not going to eat any more broccoli.” By executive order, the White House became a broccoli-free zone, and America’s highest elected official was left to enjoy his meals to the resounding cheers of 5-year-olds everywhere. The rest of us don’t usually make headlines with our food aversions, but if you sympathize with the anti-broccoli sentiments, you’re not alone. Not everyone loves their vegetables, and it’s not just an issue for parents raising Paleo kids. Plenty of adults also struggle with the Paleo advice to eat a pile of vegetables at every meal, and it’s often harder for the adults because all the advice for learning to love them is aimed at picky toddlers. When you’ve hated carrots and spinach for 20 years, it’s just not as simple as using fun utensils or cutting them into star shapes! You can still make a Paleo diet work for you, though, and it doesn’t have to mean forcing yourself to gag through a plate of kale. Overcoming the distaste of vegetables is a little tougher for adults, but there are plenty of options for the vegetable-averse, from learning to love your plant foods to simply hiding them in other recipes and moving on with your life. Why Don’t You Like Vegetables? If you’ve hated vegetables ever since you were a kid, it’s very possible that you’ve just been a victim of terrible vegetables. Canned vegetables are some of the most unhealthy “healthy” foods out there, because they’ve traumatized huge numbers of children into believing that they hate vegetables and always will. With memories of mealy peas, limp green beans, and tasteless cauliflower mush running through your head, it’s hard to even imagine that vegetables could be anything but a cruel and unusual punishment you endured to earn your dessert. But vegetables don’t have to be like that. Canned vegetables are to fresh as roadkill is to a gourmet steak! So don’t judge the fresh produce by these lifeless imitations. Sometimes, curing a lifelong hatred of anything green is as simple as going out to a great restaurant and trying some vegetables that haven’t been boiled to death. If you still can’t stand fresh (or frozen) vegetables, it’s time to figure out what you really don’t like about them. Is it the texture? The flavor? Are they bland, bitter, or just strangely “icky”? Write it down, and then use the troubleshooting guide below to help you fix the problem. Assuming you’re not using canned vegetables (see above), this means you’re overcooking them. Vegetables taste best (and they’re also most nutritious) when they’re lightly cooked, not boiled to death. Try gently steaming them, and stopping just when they change color. Or fry them in your favorite cooking fat, again, stopping when they change color. This will leave them crunchy but tender. Alternately, pick vegetables that you can enjoy raw. Carrot or celery sticks have a very pleasant “snap” to them, or if you like a stronger taste, try thin slices of red onion in your salads. Add seasonings! Salt is nothing to be afraid of; sprinkle on as much as you need to make your vegetables taste good. Spruce them up with a dash of lemon juice, pepper, ginger, garlic, or balsamic vinegar. And of course, fat makes just about anything taste better: try lard, butter, bacon fat, duck fat, or olive oil. Add as much as you like; it actually helps you absorb the fat-soluble vitamins in the vegetables. 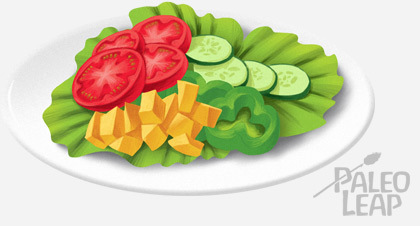 Also try incorporating your vegetables into another dish, instead of just piling them all on one side of your plate. Stir-fries are great for this; so is Paleo spaghetti. Without that daunting heap of green stuff all by itself, you might not even notice how many vegetables you’re actually eating. This is actually a very interesting problem from an evolutionary point of view, because it’s actually a genetic difference between individuals, not just a sign that you’re being “picky” or “childish.” Humans evolved a kind of instinctive dislike of bitter foods, because the bitter taste usually signifies something toxic. This aversion to bitterness is strongest in children, and generally fades as we get older, but about 25% of adults are “supertasters:” they taste various bitter compounds in vegetables that others never notice. 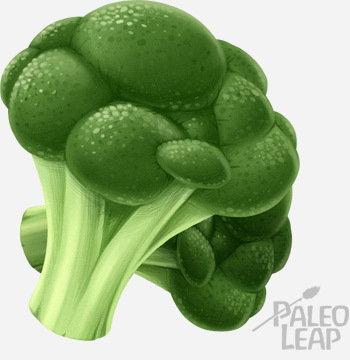 Back in the Paleolithic, this was an evolutionary advantage, because it steered us away from toxic plants; today, it’s not so great, because it makes vegetables (especially crucifers like broccoli and kale) taste disgusting. Cook them thoroughly. This really cuts down on the bitterness. 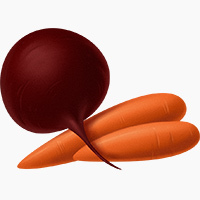 Hardier vegetables like beets can even be boiled for 30-45 minutes without getting gross. For more tender vegetables like asparagus, try blanching them first, and then frying them, so they stay crispy but loose some of that bitter taste. Add other flavors. Salty, sour, or fatty dressings really help. One study found that bitter-sensitive children voluntarily ate 80% more broccoli when they had ranch dressing to go with it. Try red pepper dip or guacamole. Avoid crucifers. Cruciferous vegetables (broccoli, kale, cauliflower, turnips, and Brussels sprouts) are some of the worst offenders when it comes to bitterness. Carrots, summer squash (zucchini and yellow squash), beets, mushrooms, and other non-cruciferous vegetables might go down better. I Troubleshot but They’re Still Gross. If you (or your kids) still aren’t crazy about vegetables even when they’re cooked right, it might be time to brush up on your vegetable-hiding skills. This method gets a bad rap as an “easy way out” or a way of “cheating,” but that’s mostly because people hide zucchini in chocolate-chip cookie dough and think they’ve made something healthy. If you’re hiding vegetables in other healthy foods, instead of making excuses to eat junk there’s really nothing to worry about. Chili or curry: a pound of frozen spinach will disappear into a curry like it never existed, and chili is perfect for pureed carrots or beets. Ground beef dishes (meatballs, meatloaf, stuffed peppers…): anything made with ground beef can disguise an astonishing amount of vegetables with barely a trace. Chop it very fine or puree it in a food processor, and toss it in! For bonus points, wrap it in bacon. Smoothies: smoothies aren’t the ideal meal replacement because they tend to have a lot of sugar, but they do make a great “transition food” for the vegetable haters. Adding a cup or so of spinach to a smoothie will change the color, but not the taste: yes, it turns green, but it doesn’t taste like spinach at all. Also remember that your taste buds may change as you continue eating Paleo. Eating sugary processed foods just makes you crave more and more sugary processed foods, and trains your taste buds to expect that instead of the natural taste of real food. Once you’re off the junk, your brain needs a little time to adjust, but in a few weeks you might notice that everything tastes a little different. Maybe even those puke-inducing Brussels sprouts aren’t so bad, after all? A good strategy is to revisit the vegetables you “hate” every month or two, just to see whether you still hate them. If you still can’t choke them down, no pressure: spit them out and have done with it. But don’t assume that just because you hated something once, that you’ll hate it forever after! Theoretically, you can survive on meat alone (if you eat some of it raw to get the Vitamin C). But this is Paleo: “surviving” is not the goal! It’s about optimal health, and that’s a lot easier to achieve when you include a broad spectrum of plant foods in your diet. There are just a lot more opportunities to get the nutrients you need, and a much lower chance that you’ll be deficient in something. That doesn’t mean you have to choke down a huge bowl of salad if you hate lettuce. Try a variety of vegetables to see what you like – ask your friends for recipes, or recruit someone to help you learn to cook them properly. You might prefer to get your greens in stir-fries or mixed dishes, instead of piled all together on one side of your plate. You might even need to hide them in meatloaf or smoothies, so you won’t have to think about them at dinnertime. That’s all OK. Just don’t let a fear of vegetables hold you back from feeling all the amazing health benefits of Paleo!